The first place you are visiting in this 13 days tour of Kerala from Trivandrum (Thiruvananthapuram) is Cape Comorin also known as Kanya Kumari. 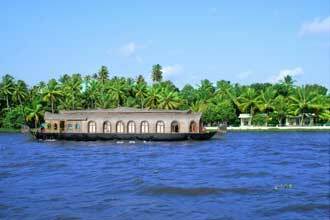 The Kerala backwaters tours package offers you a night in one of the house-boats - a nice experience. In this Kerala tour itinerary with prices, you have the possibility of selecting the hotels of your choice. This is one of the best tour of Kerala backwaters and can be combined with Tamilnadu or Karnataka. The Indian DMC Services International Lufthansa City Center - a Kerala tour specialist brings you this Kerala tour package with prices. Day 01 :- Arrive Trivandrum. Arrive Trivandrum. Transfer to hotel. Overnight Trivandrum. Morning tour of Trivandrum. Visit Sri Padmanabhaswamy Temple dedicated to Lord Vishnu. Rebuilt in 1733, it ia an excellent example of South Indian architecture. Visit the Zoological Park (closed on MonDays), Napier Museum with its bronze collection, Sri Chitra Art Gallery with paintings from various schools; from countries like China, Japan, Java and Bali. (Closed on Mon/Wed mornings.) Overnight Trivandrum. Full Day excursion to Cape Comorin. 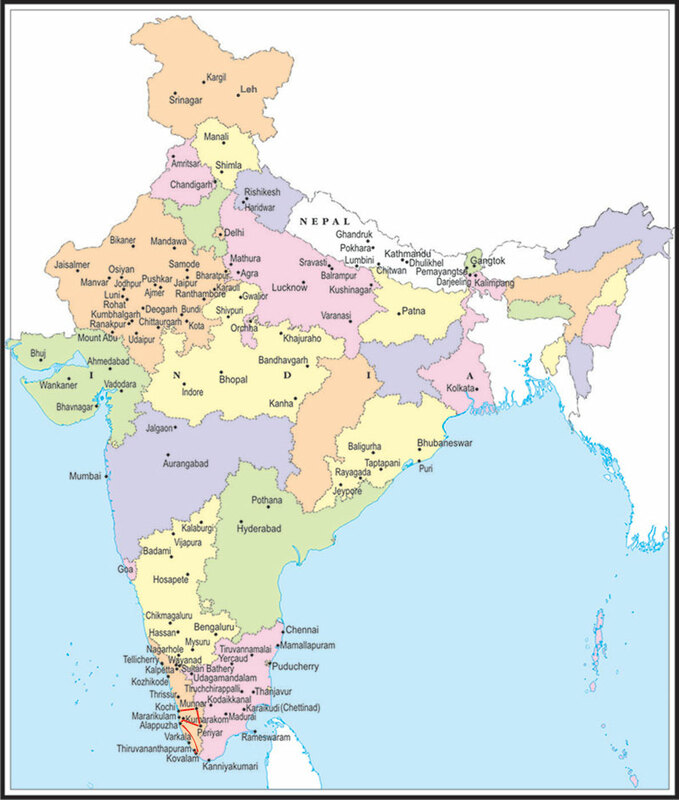 Also called Kanya Kumari is the land's end of India where the water of the Arabian Sea, the Bay of Bengal and the Indian Ocean meet. An important pilgrim centre of India, it is famous for the Amman Temple-a symbol of unity and sanctity-dedicated to the virgin Goddess, Kanya Kumari. To its South-East lies the famous Vivekananda Rock Memorial, a blend of all the architectural styles of India. Overnight Trivandrum. Morning drive to Kovalam. Kovalam is one of the most beautiful beaches of the world. The surf here is ideal for surf-riding and the water invites the visitor to ride the -Catamaran- or log, with the fisherman, or to take a cool swim. Nearby is the Beach Centre of aquatic sports. At the Yoga and Health Centre, Yoga classes and transcendental meditation are held. Ayurvedic oil massages and oil bath are given by experts. Overnight Kovalam. Day 07 :- Alleppey Kumarakom (Kottayam). Arrive Kumarakom by boat. Check-in to a hotel. Kumarakom is the loveliest Village in Kerala, blessed with nature's rare gifts is on the Eastern side of the vast Vembanad Lake. The lake provides facilities for boating, yachting, fishing, surf riding & swimming. Ideal picnic spot accessible by boat from here is Pathiramanal (Midnight Sands) a lonely island in the lake. You could Cruise along the back-waters enjoying the bracing climate & green magic of nature. Overnight Kumarakom. Drive to Periyar National Park. Free time in for game viewing. Set up in 1934,it extends to 777 square kms & forms part of the high mountain ranges, the Western Ghats. Wild life can be seen while cruising on Periyar Lake in a motor boat. Amongst the animals which can be seen are elephants, wild boar, sambar, tiger, leopard, wild dog, langur monkeys, etc. Evening free for game drive. Overnight Periyar. Drive to Munnar. Munnar - breathtakingly beautiful - a haven of peace and tranquility - the idyllic tourist destination in God's own country.Set at an altitude of 6000 ft in Idukki district, Munnar was the favored summer resort of the erstwhile British rulers in the colonial Days. Unending expanse of tea plantations - pristine valleys and mountains- exotic species of flora and fauna in its wild sanctuaries and forests - aroma of spice scented cool air - yes! Munnar has all these and more. Overnight Munnar. Drive to Cochin and transfer to hotel. Overnight Cochin. Morning tour of Cochin. Cochin is the natural harbour created by the famed underwater Malabar mud-banks whose quality ensures that the rougher the seas are outside the calmer the waters are within the Harbour. Vasco-de-Gama placed it on the world map. It has a Jewish synagogue, Portuguese churches, mosques & Hindu temples. Watch the Chinese Fishing Nets. Afternoon free. Overnight Cochin. Day free in Cochin. Later transfer to airport. Day 02 :- Trivandrum. City tour. Day 03 :- Trivandrum. Excursion to Cape Comorin (Kanya Kumari) & back. Day 04 :- Drive Trivandrum to Kovalam. Day 06 :- Drive Kovalam to Alleppey. Day 07 :- Drive Alleppey to Kumarakom (Kottayam). Day 08 :- Drive Kumarakom to Periyar. Day 09 :- Drive Periyar to Munnar. Day 11 :- Drive Munnar to Cochin (Kochi). Day 12 :- Cochin. City tour.